Just Call Me Chaviva: I Say Kosher, You Say Yum! As many of you know, I'm heading to Kosher Fest tomorrow. I'm covering the event -- mostly -- for my Gluten-Free Kosher Critic blog, but I'll probably end up posting everything here and crossing over there. I'm hoping to do some live blogging from the event, and maybe even get an interview with a few folks who create and promote my favorite kosher eats. Are you excited? I'm excited. I'm stoked. 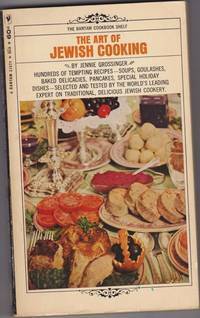 I'm so stoked, in fact, that I'd like to share with you this hilariously unhealthy remnant of Jewish food gone by: The Art of Jewish Cooking by Jennie Grossinger circa 1965. Yes, these delicious recipes call for everyone's favorite ingredient. Yes, the recipes just say "2 Tablespoons fat" or "1 cup fat." I know that nowadays we call this "butter" or "margarine" or whatever. But, still. It grosses me out to even look at the recipes. (Sorry Jennie Grossinger, I just can't help it.) Especially as I, someone who loves food (even though it's the enemy), who is attempting to battle this thing called fat with this other thing called fresh, healthy eating. I attended a mini workshop today for Jewish teen educators on how to tap into the minds of Jewish teens with food -- but healthy, relatable, unique, and experiential food. The session spoke a lot to me, and it was awesomely interactive. If you're interested in hooking up with the gal running an awesome set of programming on food for Jewish teens in the NY area, let me know, and I'll set you up. Ultimately, my goal at Kosher Fest tomorrow is to track down some healthy kosher eats that haven't been processed until kingdom come. Things that leave out the bad oils and the HFCS (or sugar, whatever) and put in the good things we need to sustain ourselves. And? Gluten-free goodies. After all, I'm not only kosher, but also gluten free, which compounds the food difficulties for an on-the-go, busy person like myself. I can't take freshly steamed veggies to work everyday, guys. It just isn't going to happen. Have you seen me in the city? Have you seen the amount of crap I schlep around? I'm a worker, student, and wife. I schlep. It's what I do. Anyhow, hopefully I can pique your interest with my perfectly delectable posts tomorrow from Kosher Fest. I'm interested in how companies are understanding and marketing "kosher" food. Is it just kosher now? Did we lose the Jewish part of kosher food? What, to you, is kosher food? Is it just kosher food or is it Jewish food? Is it Sephardic or Ashkenazic? Gefilte fish and cholent or baba ganoush and shaksuka? This week it's all about food. So? Dig in!